02-Oct-2015 -- Twice a year - in April and October - New Mexico’s "Trinity Site” (where the first atomic bomb was tested in July 1945) opens to the public. I was staying in nearby Socorro, New Mexico, in preparation for the October 2015 opening the next day. 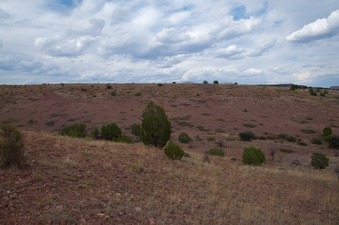 But of course, while I was in the area, I had to visit the nearby Degree Confluence Point - just to the west of Socorro. This is an easy confluence point, lying just 0.25 miles from a road, in “The Box” recreation area (used by hikers and rock climbers). The confluence point lies on a rock-strewn slope, in sparsely-vegetated ‘badlands’ - with little growing except cactus, and a little grass. There’s a ranch nearby; I pity the cattle who have to graze such poor land. Unfortunately, once again, a previous visitor has left a rock cairn to mark the point. I wish that people would stop doing this. Let’s leave these points in their original state, so we can better sample what they’re really like.